Everything you need shipped in one box - including 3 dividers per opening, back stops, and all hardware for fast, easy setup and deployment. 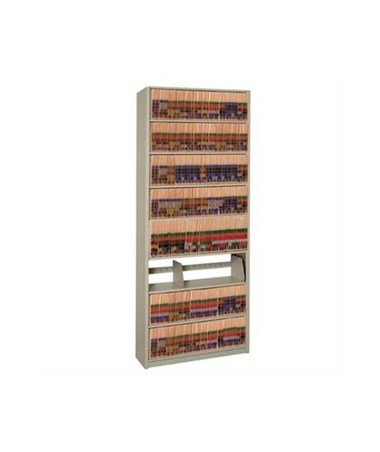 Space-efficient Letter-size document storage Starter unit with 8 openings, 9 shelves, and adjustable dividers. Powder-coated steel construction means a lifetime of use. 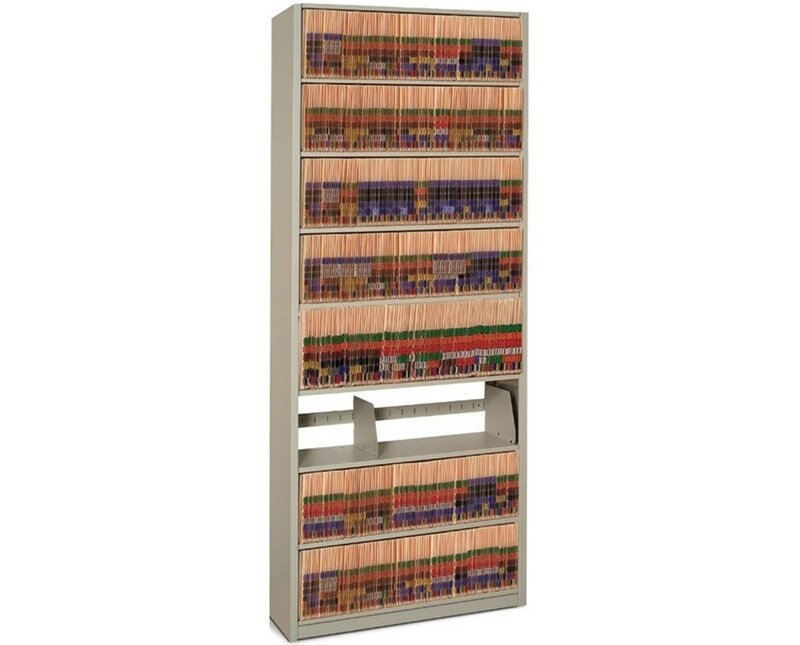 Fully expandable and customizable for your office's unique storage requirements. 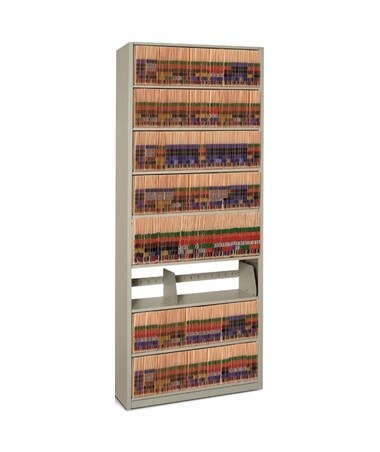 The uniquely customizable Datum 4Post™ filing system offers maximum efficiency and flexibility, with customization and expansion options to handle the medical filing needs of virtually any medical office, clinic, hospital, or other facility. These 4Post™ Starter units ship in one box containing everything you need for rapid and easy setup and deployment, including 3 dividers per opening, top shelf, shelf supports, 2" kick plate, and a generous 272 Lineal Filing Inches (LFI) of storage. 4Post™ units are super-easy to set-up and assemble. All units include 88-1/4" high uprights, and 2" high front base. Starter units include two closed "L" uprights, which work in conjuction with Adder units to create expanded shelving systems. See additional images above, or click here for a diagram of Starter and Adder units. Manufactured in the USA, the 4Post™'s shelves are made of 22 gauge cold-rolled steel with a 3/4" flange on all sides for additional support. The 4Post's™ modular design allows you to "grow as you go" - begin with this Starter unit, then select Adder units to accomodate your facility's storage requirements as needed. The Datum 4Post™ is available in 19 standard colors, to match the decor and workflow of any professional medical environment. Pick any of the 19 colors in the 4Post™ color chart, then choose the color you want from the drop-down list above. Optional custom colors are available - contact us for more information. You can also choose from either seven (7) or eight (8) openings as specified in the dropdown box above. These 4Post™ units measure 36" wide, 88-1/4" high, and 12" deep. The 4Post™ is ready to expand and grow along with the filing and storage requirements of your office, clinic, or hospital. The 4Post™ is also compatible with a wide range of Datum products and accessories. The 4Post™ is compatible with Datum's TrakSlider™ system for even greater storage efficiency in limited spaces. Datum TrakSlider™ systems can more than double capacity by converting stationary files into moveable systems that require only a fraction of the floor space. All 4Post™ units are pre-punched for easy conversion to TrakSlider™ systems without the need for drilling. The Datum 4Post™ system can also accommodate the locking Datum TambourDoor™, for secure HIPAA-compliant document storage. Like all Datum products, the 4Post™ is backed by a limited Lifetime Warranty. Ships in one box that includes 3 dividers per opening, and all necessary hardware for rapid setup. "L" and "T"-shaped uprights allow maximum configuration flexibility. Fully expandable, and compatible with Datum TrakSlider™ systems. Accommodates the Datum TambourDoor™ for secure HIPAA-compliant storage. All Datum products are covered by a Lifetime Warranty. 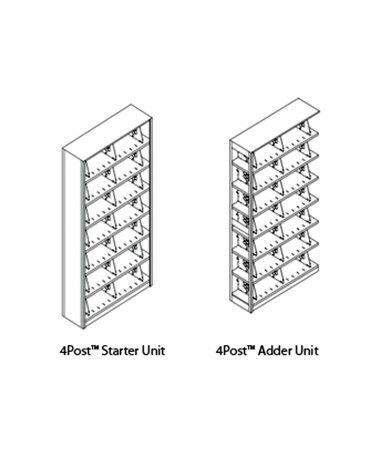 4Post™ shelving starter unit with 8 openings.